French 19th-century brown morocco gilt with doublures of green morocco gilt, signed at base of spine by Lenègre and lettered: Preces Piae. Sold by Sotheby's (London, May 24, 1848, lot 48) to H. Bohn, who sold it in 1848 to the Earl of Ashburnham (appendix, no. 58); his sale, (London, 1899, no. 19) to Quaritch; purchased by J. Pierpont Morgan (1837-1913) from Quaritch before 1913; J.P. Morgan (1867-1943). 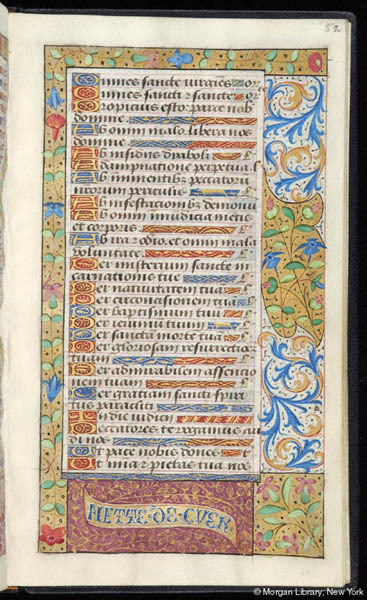 Ms. book of hours for the use of Rome (Hours of the Virgin); written and illuminated in Paris, France, 1490-1500. Artist: a follower of Jean Pichore. Decoration: 5 full-page miniatures, 9 half-page miniatures, 12 small miniatures, numerous calendar illustrations.